Photosynthesis – turning the sun’s energy into food for plants – is the biological system that feeds the world. But despite its awesome power, the process is extremely inefficient. We can’t really blame plants for this because photosynthesis evolved for ancient earth’s conditions. What if we could improve on this fundamental, ancient process? One could imagine using solar energy and biology to make chemicals or liquid fuels in a far less-polluting way than today’s methods. For years, synthetic biologists have made numerous attempts to improve the ability of organisms, such as bacteria, to translate solar energy into chemical production, but efforts have been met with little success. My research group set out to rethink photosynthesis by assessing how a leaf converts solar energy to growth. 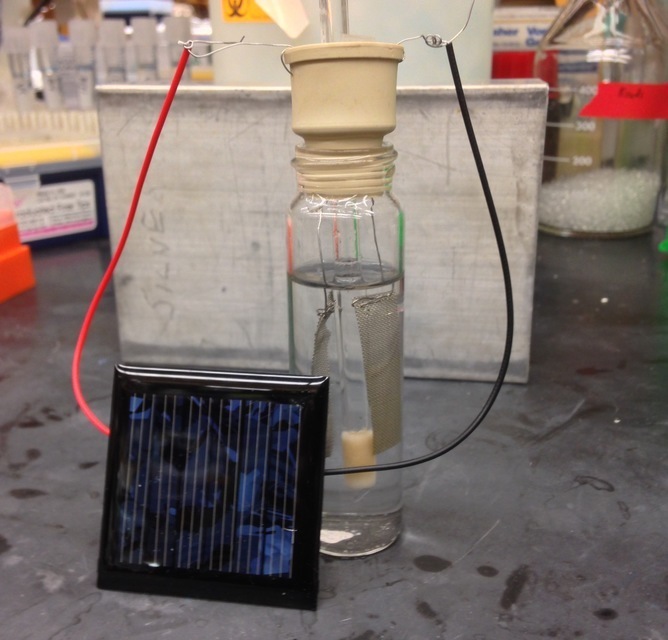 We developed a biological process that makes chemicals or liquid fuels directly from solar cells. This proof of concept offers a new way to think about renewable energy. By breaking photosynthesis down into reactions, it becomes very clear that one reaction is the heart of it: water splitting. Water splitting is the process by which water is broken down into hydrogen gas (H2) and oxygen gas (O2). Luckily for us, Harvard University professor Daniel Nocera has already produced a catalyst, the “artificial leaf”, that is capable of breaking water into its component elements. While there are many water-splitting catalysts available, the artificial leaf is special for several reasons: it’s made of cheap materials, it operates at neutral pH (i.e. tap water), and it can be operated by ordinary solar panels. Therefore, an artificial leaf catalyst is capable of splitting water from one of the most abundant energy sources in the world: sunlight. The artificial leaf catalyst converts solar energy to H2 and O2 gasses. These are attractive fuels in principle but lack the infrastructure to be widely adopted in the near future. For example, without hydrogen filling stations for cars or hydrogen pipelines into homes, it’s difficult to imagine hydrogen rapidly replacing fossil fuels. We decided to combine a futuristic fuel – hydrogen – with what can be considered old news: bacteria. The soil bacterium Ralstonia eutropha is an organism capable of growing mainly from H2 and carbon dioxide. We figured it would be possible to use the hydrogen generated from the artificial leaf to drive the growth of Ralstonia. And from that bacteria’s growth, we could get our desired product: a liquid fuel or chemical. Dubbed the “bionic leaf”, this system converts sunlight shining on a solar panel to electricity. Electricity travels to a glass vial containing liquid where both Ralstonia and the water-splitting catalyst are immersed. The electricity drives the catalyst to generate O2 and H2, which Ralstonia consumes along with bubbled carbon dioxide to grow. In the lab, we piped in carbon dioxide from a tank; in a commercial situation, we could use carbon dioxide emissions from a polluter, such as a power plant. Just like plants, the bionic leaf converts sunlight into “biomass” or, biological material. Here, we produced the alcohol isopropanol, a compound which can be used for the production of fuels. Where many terrestrial plants convert sunlight to biomass at an efficiency of about 1%, the bionic leaf does so at an efficiency of up to 3.2%. The key to this efficiency is the increased light harvest from solar panels to drive water splitting. 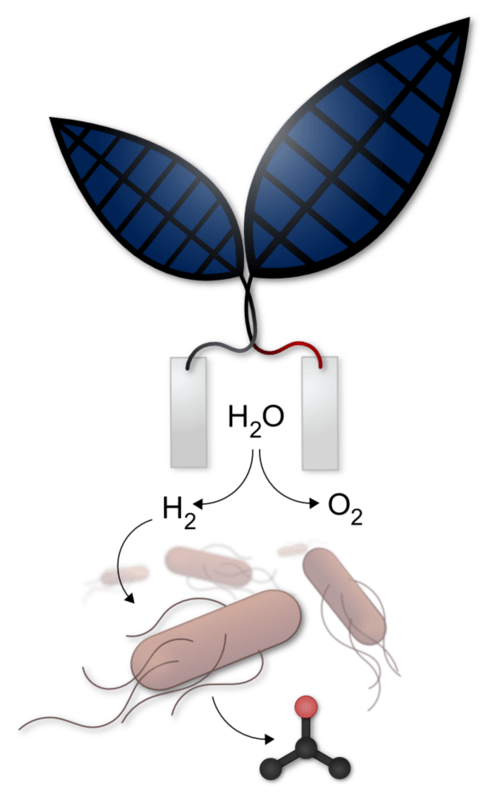 The solar photovoltaic panels act as a sort of amplifier, increasing the amount of solar energy delivered to the bacteria-growth medium than what a typical plant can harvest. In addition to increased efficiency, this setup bridges the strengths of each technology. Solar panels are great at harvesting sunlight but storing energy is a challenge. Also, panels aren’t really designed to produce chemicals. Microbes, in contrast, can produce a wide range of high-value compounds but require constant “food” to grow – in this case, hydrogen, sunlight and CO2. By combining these technologies, solar energy produces the necessary molecules our Ralstonia require to grow and produce chemicals. After reconstructing photosynthesis, we set out to prove that the bionic leaf could be used to synthesize, or produce, chemicals. To do this, we used an isopropanol-synthesizing Ralstonia strain engineered by Tony Sinskey’s lab at MIT. Our results provided the first proof-of-concept of solar-driven chemical synthesis for the bionic leaf. The bionic leaf was designed from the idea of personalized energy. Our current liquid fuel infrastructure – refineries, pipelines – is massive and optimized for fossil fuels and our design is unlikely to provide a comparable fuel yield in the near future. But the bionic leaf has lots of potential to perform as a decentralized source of off-grid power. One could imagine a portable, solar-powered bioreactor that is virtually impervious to physical or cyber attacks aimed at disabling a population’s power. Although replacing gasoline or diesel fuel with a solar fuel is tantalizing, the most practical application of the the bionic leaf is likely to translate as a chemical-producing box kept in your backyard. Because its only energy requirement is sunlight, the bionic leaf could also be used as a mobile energy source in countries that don’t already have a large liquid fuel infrastructure. We have only touched on the potential of the bionic leaf. Biology is truly the ultimate platform for chemical synthesis meaning there is a wide range of compounds we can theoretically produce. Ralstonia eutropha, for one, naturally produces bioplastic precursors in large quantities. With genetic engineering, one could imagine the solar-driven synthesis of drugs, materials, or high-value chemicals. The bionic leaf would then function more as a mobile lab than a fuel box. In addition to chemical synthesis, Ralstonia eutropha can also metabolize a great number of chemical pollutants., In that scenario, our current system could be modified to clean water.